Zewie was found on August 21st near Mobile Bay, Alabama, and he died from probable watercraft injuries. “The best way I know to honor Zewie’s legacy is to increase awareness and education of boaters that manatees are in their waters and how to protect them,” said Rose. Gregarious and inquisitive, Zewie was usually seen in the company of other manatees and was known to travel from Florida to Alabama, Mississippi, and Louisiana. In August, we received the sad news that Zewie, an adoptee in Save the Manatee Club’s Adopt-A-Manatee program, had died. Zewie was found on August 21st near Mobile Bay, Alabama, and he died from probable watercraft injuries. Zewie was an endearing manatee, and he touched the lives of many people. He was at least 27 years old, and he had been tracked since 2009, which assisted researchers in better understanding manatee migration, travel, important habitat, and other behavioral factors. 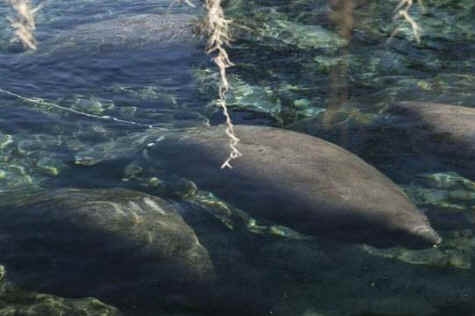 Zewie was tracked by the Dauphin Island Sea Lab’s Manatee Sighting Network (MSN) and the U.S. Geological Survey’s Sirenia Project. He was first documented in 1987 as a dependent calf in Crystal River, Florida. From 1987 through 2009, Zewie was only sighted at Crystal River, but in June 2009, he was spotted with two other manatees in Alabama’s Mobile-Tensaw Delta. In the summer months, manatees are much more widely distributed, and sightings in the northern Gulf of Mexico and Atlantic coast states are relatively common. Dauphin Island Sea Lab started their Manatee Sighting Network in 2007 to track manatees in Mobile Bay and the surrounding waters of Alabama and Mississippi. 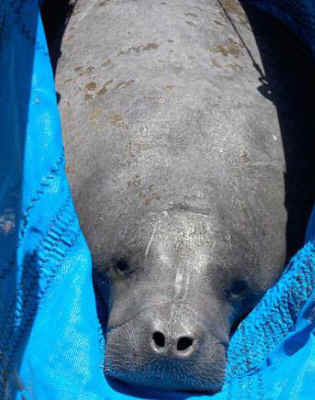 On August 11, 2010, Zewie became the third manatee captured and tagged in Alabama waters. His distinguishing feature was a star-shaped scar in the middle of his tail. Gregarious and inquisitive, Zewie was usually seen in the company of other manatees and was repeatedly observed in Chacaloochee Bay in the Mobile-Tensaw Delta and in the Fish and Dog Rivers of Mobile Bay. In the winter of 2010, Zewie migrated back to Florida, and he returned to Alabama in the spring of 2011. He made the 400-mile trip in one month and was sighted in Dog River in April. Dog River is a known manatee hotspot in Alabama and the place where Zewie was first tagged. In summer 2011, Zewie surprised researchers by traveling even further west than before. His summer 2011 forays were centered around Mobile Bay, the Pascagoula River in Mississippi, and in Lake Pontchartrain, Louisiana. Zewie remained in Lake Pontchartrain through August 2011, and he was tracked by MSN personnel until he lost his tag when Tropical Storm Lee moved through the northern Gulf of Mexico in September of that year. Zewie was tagged for a second time in the winter of 2013 by USGS researchers in Crystal River, Florida, and data showed that he frequently wintered there. He then spent the summers of 2014 and 2015 back in Alabama and Mississippi waters. Zewie had been tracked since 2009, and he assisted researchers in a better understanding manatee migration, travel, important habitat, and other behavioral factors. Zewie will be missed. At the time of his death, he had many adoptive “parents” who are members of Save the Manatee Club. Zewie’s adoptive parents have received a letter from Save the Manatee Club Executive Director Patrick Rose.